"Darling, have you seen my junior high school math book? I need to review percentages again. Oh wait, can you just figure out what 17% of $87.45 is so I can send this off in the mail..."
This is my current morning endeavor (Peacock shawl from Fiddlesticks using Schaefer's Trenna in the Purple Violet Colorway. Trenna is only available from Little Knits. Link is in the sidebar). Trenna is really a pleasant knit--not splitty, not slippery, with a nice, gloss to it. And it's very soft to touch. 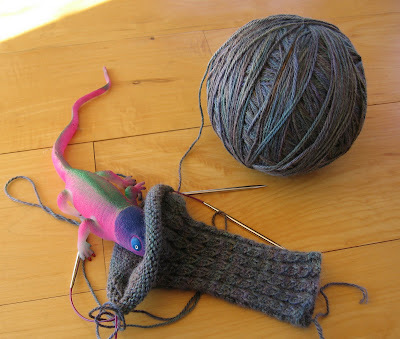 After dinner I pick up a semi-mindless project like the Cheshire sweater. I did the cuffs in a variation of a twisted baby rib (knit in back of all knit stitches so they look neater). Such pretty yarn! The colors just flow back and forth in this lovely purple-green-blue wash.
Sock or some endless stockinette project are generally relegated to the car, waiting rooms, and places where instant interruptions will cause no great loss. Here is an Adirondack Soxie sock...up the the gusset at this point. This stuff is just scrumptious to work with--tightly spun, springy, soft, and the colorway, Speckled Sea Mist, is nice and fresh. Ewe Need Yarn carries just about every color Adirondack offers (see the sidebar for the link) and I am embarrassed to admit that I ordered most of them. I know it sounds a bit whiny, but Adirondack uses too much turquoise. I like turquoise, but it does see to find its way into almost every blend. More reds. Fewer turquoises. Love your hints. 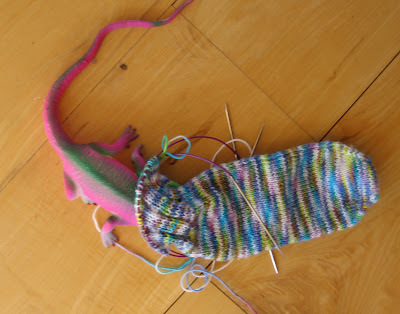 Found your blog on KR sock forum. and I'm not sure how to do the twist or if it's written correctly. 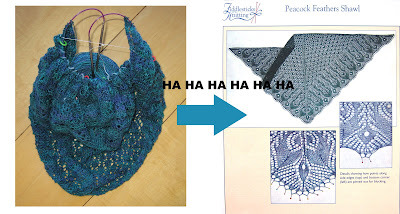 (specifically I'm puzzled by the part of the pattern instructions that say "then knitting into the first stitch, and slipping THAT to the working needle". When/how do we move the second stitch to the working needle?) Could the rib pattern you are using for the Cheshire sweater be substituted for the pattern in this hat? Thanks for your help. Row 2: P2, slip the first stitch purlwise to the right needle. Knit the next two stitches on the left needle. 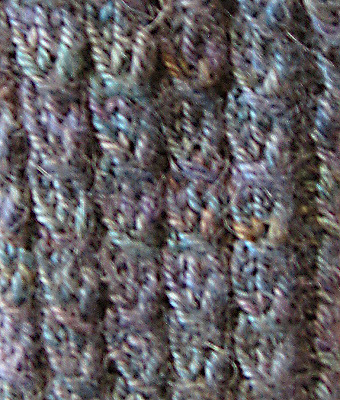 Then, on the right needle, yank the slipped stitch over the two knitted stitches. The yarnover in Row 3 leaves a hole, which I didn't want. So I knitted into the backs of all the knit stitches, as well as the yarnover itself. This twists the stitches and makes everything a bit firmer. You don't have to do that. And yes, you can use this pattern on a hat. It's lovely! Wow! Thanks for your help. I'll give it a try.